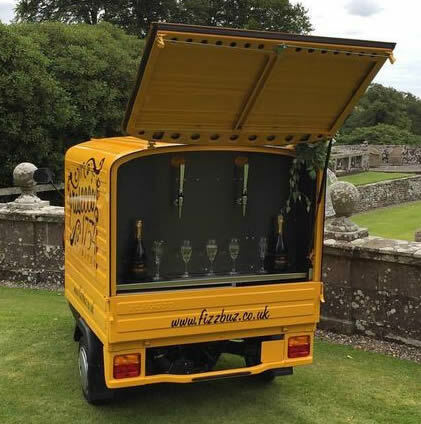 With Prosecco becoming ever-increasingly popular in UK, overtaking even the exports to the US, many novel ways of marketing this Italian bubbly have sprung up, one of them being a mobile service van which serves it from the tap like draught beer. This despite specific EU law which is followed by UK too that prescribes it may be poured only from the traditional bottles. It is unlikely that the practice of calling it ‘Prosecco on tap’ would continue and is being generally replaced by Frizzante 1754. Prosecco has two appellations; in both the appellations-doc and docg (since 2009-PDO in the international parlance of EU laws), may be served only from the traditional bottles of pre-determined sizes and UK follows the laws of the EU countries for labelling. The Consortium had threatened to sue such bars through UK authorities; in fact, the UK Food Standards Agency has clearly laid out the specifications. In several cases, the bar owners already call their bubbly by other names that include the word ‘Frizzante’ (low pressure- sparkling ) which is allowed by the Italian laws- DP 1754 Frizzante is one such acceptable classification (where DP infers the popular term Draught Prosecco). Prosecco can be made as Frizzante (with the pressure of 3.5 bars) or Spumante (equivalent to champagne pressure of around 5.5 atmospheres)-Frizzante is more popular, especially with the keg dispensation. An interesting case in point is that of a Welsh couple who invested over £20,000 to get a Prosecco van and ran into trouble with the law. 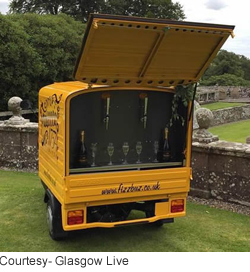 Earlier this year Caroline Roberts was ordered by the UK authorities to call her Prosecco ‘Frizzante 1754’ because she was offering it on tap rather than the bottle in a similar van called ‘Bella, the Prosecco Van’; this was reported in delWine. The confusion of nomenclature notwithstanding, the penchant for Prosecco in UK has moved from vans to even hotel bathrooms now. Recently one of the popular hotels in North Wales, Bodelwyddan Castle has installed in its most exclusive rooms Prosecco on tap for a limited period, after feedback from a guest couple who stayed at the adults-only Warner Leisure Hotels property saying all that was missing from their experience was ‘Prosecco on tap’. 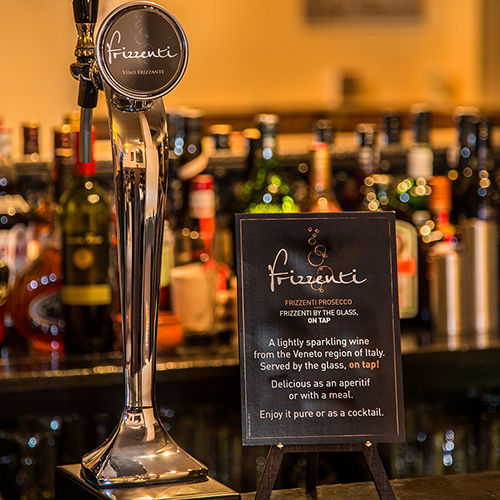 Its ‘en suite’ rooms are now equipped with special pressurised taps in the bathroom from which the Italian Frizzante will be available on tap 24-hours a day- even though for a limited time. This has been achieved by installing an oxygen-free, hygienic, stainless steel ring main, with a pressure of 3.5 bar, same as you expect from the bottle of Prosecco. You can safely bet that the publicity material of the hotel would say Frizzante 1754 or DP 1754 and not Prosecco on tap. Up until the 1960s, Prosecco sparkling wine was quite sweet, not unlike Spumante d’Asti in Piedmont. But with the advent of technology and desire to improve quality, it became much better and drier in flavours over the years and started getting popularity during the last decade or two. My love affair with Prosecco started 10 years ago, in June 2007 when I visited the now docg region between Conegliano and Valdobbiadene, including Cartizze hills. I was so sure of its potential in India that I tried to convince the then President of the Consortium, to include India in its wish list for promotion. Then there was hardly any import of this bubbly. My logic was simple: it was light, fruity, fresh and frothy and Italian-with just the right acidity. At a fraction of the price of champagne, it would become a darling of the lovers of bubbly because champagne was too expensive due to heavy taxation. I was regretfully told that they did not have funds to focus on India but I kept on pushing the button on promoting Prosecco due to its affordability. The consortium had their eyes on the US and UK and luckily, there was a recession after a couple of years and as they say, the rest is history- they have crossed the 500 million bottle mark when champagne has been languishing between 300-330 million bottles. In the meanwhile, perhaps with the noise created by the imports in the US and UK, it started gaining popularity in India steadily. Today, there is hardly an importer who does not have at least one Prosecco label in the portfolio- many have two; and they are very happy with the consistent average growth of over 20% annually. It brings back the question of why the Brits decided to call it Frizzante 1754. My Research leaves me confounded why the Brits would choose 1754. We know that this is the year that the word Prosecco appeared for the first time in the book Il roccolo Ditirambo, written by Aureliano Acanti: 'And now I would like to wet my mouth with that Prosecco with its apple bouquet'. But the first known mention of the name "Prosecco" is attributed to the English traveller and social commentator of 16th and 17th century- Fynes Moryson who visited north of Italy in 1593 during the course of his extensive European travels from 1591-1598. He noted, "Histria (Province of Treviso in North-West Italy was a part of the ancient Istria) is divided into Forum Julii (an ancient city in Friuli), and Histria properly so called... Here grows the wine Pucinum, now called Prosecho, much celebrated by Pliny". He placed Prosecco among the famous wines of Italy. I would think that more appropriate term should have been Fynes 1593 or Fyne 1593! According to the EU laws which became more stringent in 2009 after the exponential growth in popularity overseas, Prosecco may be produced from Glera grapes (earlier known as Prosecco grape variety) in a specified areas in Northeast Italy, the Consortium lost a legal case in Australia where the producers who migrated from Italy had been growing the ‘Prosecco’ grapes for decades and so have been allowed to continue making Prosecco from these grapes. So don’t be surprised if you come across a bottle saying Made in Australia-Prosecco. You may call it by any name in any country but Prosecco remains the most popular sparkling wine variety in the world and is identified as the ‘champagne’ of Italy in India-a majority of drinkers still insists on calling it champagne. And its demand is increasing faster than supply.